The Scottish Government is currently consulting on implementation of the land use planning elements of European Directive 2012/18/EU (the SEVESO III Directive) on the control of major- accident hazards involving dangerous substances (referred to as hazardous substances in local law). Consultation occurred in 2014 in England and Wales. The SEVESO III Directive aims to reduce the risks and consequences of major- accidents. The land use planning elements relate to taking account of the aims of the SEVESO III Directive in planning policies and decisions, including maintaining appropriate safety distances between major hazard sites (referred to as establishments) and other development and protecting areas of natural sensitivity. The Scottish Government is required to implement the land use planning aspects of the Directive by 1 June 2015. 1 June 2015 is also the date by which other jurisdictions in the UK, and other Member States must implement SEVESO III. The main reason for the new version of this SEVESO III Directive is changes in the European chemical classification system, which are also to be implemented by 1 June 2015. New public participation requirements have also been included in the Directive to bring it into line with the Aarhus Convention. There is no requirement in the Directive to fundamentally change the existing land use planning framework regarding hazardous substances consent. Operators will still be required to apply to the planning authority for consent for hazardous substances at or above set amounts (controlled quantities). This is the case also in England and Wales (and in Northern Ireland). In Scotland, the planning authority will continue to consult with key agencies, such as the Health and Safety Executive (HSE) and the Scottish Environment Protection Agency (SEPA) and there will be public participation in decision making. Where the planning authority grant planning hazardous substances (PHS) consent, HSE will continue to designate consultation zones to guide and inform consideration of the location of future development near establishments. – A new schedule of substances and thresholds requiring hazardous substances consent and related transitional arrangements regarding consents. – Amendment of application and appeal procedures for PHS consent and for those planning permission cases within scope of the Directive to reflect public participation requirements. The Scottish Government is also taking the opportunity to bring PHS consent procedures further into line with modernised planning procedures. The Town and Country Planning (Hazardous Substances) (Scotland) Regulations 2015 will be issued (and similar in England and Wales, and separately in Northern Ireland), with PHS consent and appeal provisions etc., as well as related amendments to other planning legislation (Scotland). The Scottish Government’s consultation document is here. A worker was killed on his first day of work, when the forklift truck he was driving overturned, crushing him. Britain’s Health and Safety Executive (HSE) press release is here. The court was told that the deceased was not wearing a seatbelt and there was no company policy in place to ensure seatbelts were worn. HSE’s investigation also found that the forklift trucks in use at the company were not suitable for operation on uneven surfaces or over loose material such as that found on the site. Alternative vehicles, such as four-wheel-drive, all terrain shovel loaders, could have been used and were already in use elsewhere on the site. Since the incident, the company now uses these vehicles to move all the material on the site and it is now company policy for seatbelts to be worn at all times in all vehicles. Recresco Ltd, of Lane End, Urban Road, Kirkby-in-Ashfield, Nottingham, was fined £180,000 and ordered to pay £38,693 in prosecution costs after pleading guilty to a breach of the Health and Safety at Work etc Act 1974 on 17 December 2014. “Ian was just a few hours into his first day at work for Recresco Ltd when this tragic incident occurred. Our investigation revealed a series of failures at the plant, with forklift trucks being used in an area that was completely unsuitable because of the uneven surface created by waste material scattered around the floor. There was also no policy in place for the use of seatbelts. Consultation is occurring on changes to Local Air Quality Management (LAQM) in England. This is a follow-up to consultation that took place in 2013. The latest consultation contains a number of proposals to reduce regulatory and administrative burdens in line with commitments made under the UK Government’s Red Tape Challenge, and to improve the overall effectiveness of LAQM in dealing with current air quality challenges. – part two which provides an overview of non-regulatory changes such as streamlining of reporting processes and providing local authorities with a role to tackle PM2.5 (fine particulates) to be set out in statutory guidance. Part two will be subject to a further, more detailed consultation in late 2015. The new statutory instrument will be The Air Quality (England) Regulations 2015 and will replace the existing regulations. The Wildlife and Countryside Act 1981 (WCA) is the principal legislation dealing with non-native species in Britain. It will shortly be amended by the Infrastructure Bill for England and Wales (when it is enacted). I have blogged a number of times following progress. The WCA has already been amended in relation to England and Wales by various pieces of legislation, including the Wildlife and Countryside Act 1981 (Variation of Schedule 9) (England and Wales) Order 2010, the Natural Environment and Rural Communities Act 2006 and the Countryside and Rights of Way Act 2000. Section 14(1) of the WCA makes it illegal to release or allow to escape into the wild any animal which is not ordinarily resident in Great Britain and is not a regular visitor to Great Britain in a wild state, or is listed in Schedule 9 to the Act. It is also illegal to plant or otherwise cause to grow in the wild any plant listed in Schedule 9 to the Act. I have blogged separately about the situation in Scotland, where Section 14 operates differently. The Schedule 9 list of animal and plant species has been amended by the Wildlife and Countryside Act 1981 (Variation of Schedule 9) (England and Wales) Order 2010. Offences under section 14 carry a maximum penalty of a £5,000 fine and/or 6 months imprisonment on summary conviction (i.e. at Magistrates’ Court) and an unlimited fine (i.e. whatever the court feels to be commensurate with the offence) and/or 2 years imprisonment on indictment (i.e. at Crown Court). Guidance on Section 14 of the WCA gives further information. Here is a list of species in Schedule 9 of the WCA for England and Wales. Section 14ZA of the WCA, as inserted by section 50 of the Natural Environment and Rural Communities (NERC) Act 2006, creates an offence of selling, offering or exposing for sale, or possessing or transporting for the purposes of sale, non-native species that are listed in Schedule 9 to the WCA and are specified for the purposes by the Wildlife and Countryside Act 1981 (prohibition on Sale etc. of Invasive Non-native Plants) (England) Order 2014. Section 14 ZB of the WCA, as inserted by section 51 of the NERC Act allows the Secretary of State to issue or approve codes of practice on animals which are not ordinarily resident in and are not regular visitors to Great Britain in a wild state and animals or plants included in Schedule 9 to the WCA (e.g. Horticultural Code of Practice). The codes alone cannot be used to prosecute but must be taken into account by a court in any case in which they appear to the court to be relevant. Section 18D of the WCA, as inserted by section 52 of the NERC Act provides that a wildlife inspector may, at any reasonable time, enter and inspect any premises (which excludes dwellings) for the purpose of, amongst other things, ascertaining whether an offence under section 14 is being, or has been, committed on those premises. Section 18E further provides that a wildlife inspector may, for the purpose of ascertaining whether a section 14 offence is being, or has been, committed in respect of any specimen, require any person who has the specimen in his possession or control to make it available for examination, and may require the taking of a sample from a specimen found during an inspection. From 1st January 2015, the sulphur content in ships’ fuel must be below 0.1 % in Sulphur Emission Control Areas (SECA). International regulations for pollution from ships are contained in the IMO “International Convention on the Prevention of Pollution from Ships”, known as MARPOL 73/78. On 27 September 1997, the MARPOL Convention was amended by the “1997 Protocol” which includes Annex VI titled “Regulations for the Prevention of Air Pollution from Ships”. In particular, Annex VI regulates emission of sulphur oxides (SOx), nitrogen oxides (NOx) and particulate matter. Annex VI entered into force on 19th May 2005 and in October 2008 the International Maritime Organisation (IMO) adopted a set of amendments to Annex VI of the MARPOL Convention. The set of amendments to Annex VI of the MARPOL Convention introduces new standards for emission from ships of sulphur oxides (SOx), particulate matter and nitrogen oxides (NOx). The most stringent changes relate to SOx emission. Reduction of SOx and particulate matter emission is achieved by limiting the maximum sulphur content of the fuel oils used onboard. Two sets of emission and fuel quality requirements are defined by Annex VI: (1) global requirements, and (2) more stringent requirements applicable to ships in Sulphur Emission Control Areas (SECA). On the global level, the sulphur cap is reduced initially to 3.50% (from the current 4.50%), effective from 1st January 2012; then progressively to 0.50 %, effective from 1st January 2020 (or in 2025 at the latest), subject to a feasibility review to be completed no later than 2018. For SECA, the requirements are – from 1st July 2010, the maximum sulphur limit is reduced to 1.00%, (from 1.50%), while from 1st January 2015, sulphur content in ships’ fuel must be below 0.1 %. 4. United States Caribbean Sea area – as defined in Appendix VII of Annex VI of MARPOL (SOx, NOx and PM). 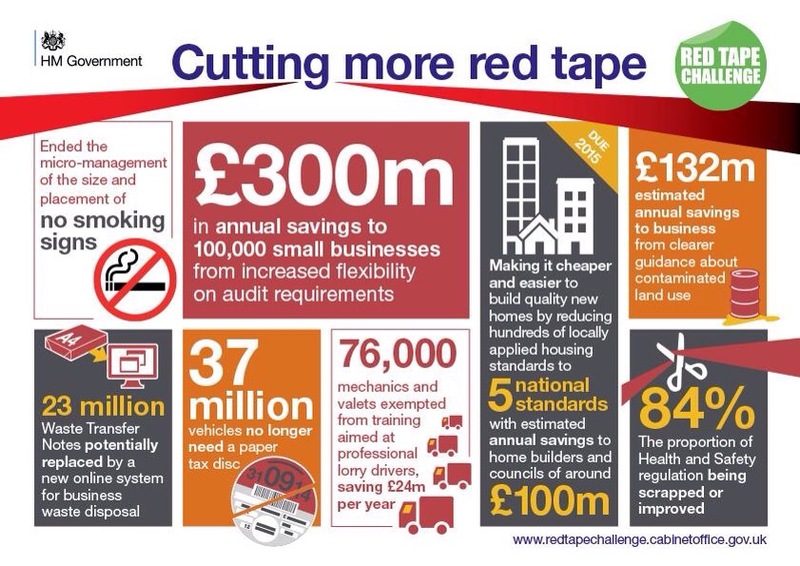 * red tape challenge outcomes – see graphic at the end of this post. * some self-employed persons to be exempt from H&S – consultation occurred on new ‘The Health and Safety at Work etc Act 1974 (General duties of Self-Employed Persons) (Prescribed Undertakings) Regulations 2015’ (date tbc) – if enacted – these would define the activities where self-employed persons would continue to have H&S duties. * planning law 2014 – major changes have been occurring and are still proposed – this Parliament Briefing Paper is a good summary. * ESOS – this is the UK response to Article 8 of the EU Energy Efficiency Directive (subscribers have already been Email Alerted about this). * preparing for dry recyclables separation – commencing 1st January 2015 in England and Wales (material types to be collected separately where reasonably practicable) – already commenced 1st January 2014 in Scotland (no separate collection of different material types). * flood control – Government Policy is here. * fracking – current Government guidance is developing. I have blogged recently on the Infrastructure Bill. The Parliament Briefing Paper gives a summary. * referendum and devolution, Scotland Act 2012 and the Smith Commission – Scotland is to remain part of the UK with further powers devolved to it. The Smith Commission Heads of Agreement is here. * land reform – consultation is occurring on proposals for further land reform. * plastic bags – new state-wide California ban on single-use bags, Australian States bans for thin HDPE bags, COM (2013) 761: Proposal for a DIRECTIVE OF THE EUROPEAN PARLIAMENT AND OF THE COUNCIL amending Directive 94/62/EC on packaging and packaging waste to reduce the consumption of lightweight plastic carrier bags. * TTIP – the Transatlantic Trade Investment Partnership has many implications. Basic information is here. New Cardinal Environment Limited website coming end February 2015.